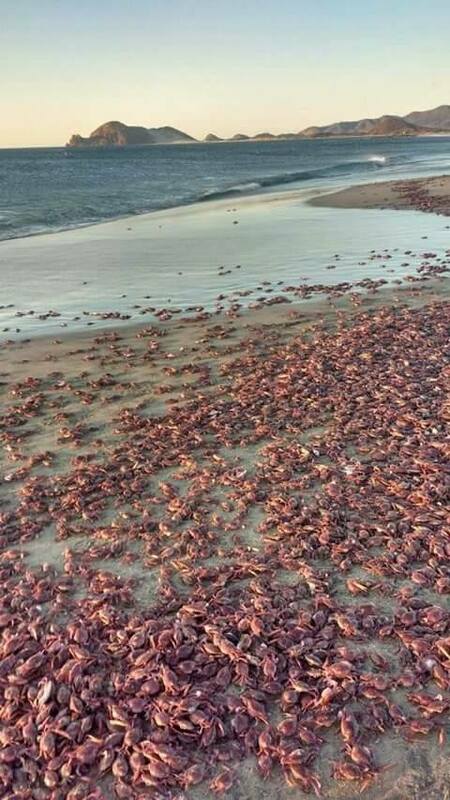 An astonishing and unexpected spectacle was experienced this morning a south western port of Mexico, with the appearance of tens of thousands of crabs on the shore of the beach of the municipal agency of Salinas del Marqués. The phenomenon, according to the local people, is due to the currents of cold water that causes the crustacean to look for the shore and the waves expel it to the beach. The apparition occurred on the salt flats of the Salinas del Marqués, where hundreds of people came to appreciate the fact. Some families were collecting them and carrying them, in buckets, jabas or coolers. This is the first time that this phenomenon occurs, two years ago dead fish also appeared on the shore of this beach. I searched for other sources of this phenomenon. None found. Some are saying on FB they are simply migrating Tracie?